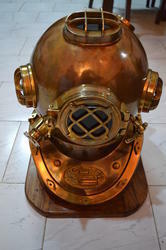 We are manufacturer and exporter of Divers Antique Divers Helmet made of Steel and brass with wooden base. We have wide range of antique Diving Helmets. 18 inch Iron Diving Helmet its weight is 7 Kg. Copper diving helmet with Clock. We are the most trusted name amongst the topmost companies in this business, instrumental in presenting Diving Helmets. Diving helemt brass-iron, alluminium antique 18 inch size. Buy excellently finished, dimensionally accurate and durable range of Brass Divers Helmets are competitive prices. 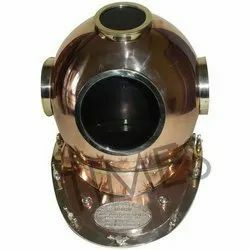 Our company is one of the leading Manufacturers and Suppliers of a variety of Brass Divers Helmets. We produce them using superior grade materials. Buyers can purchase Brass Divers Helmets from us at market leading prices and place bulk orders. Avail from us an exclusive assortment of helmets that are available in various designs to suit the diverse choices of clients. Made using quality material, these helmets are acknowledged for exquisite design, superior finish and luster look. Further, we also provide these helmets in customized specifications to the clients. We are counted among the foremost manufacturers and exporters of DH – 249760. Our product range is widely used in museums and other antique storage houses. These products are manufactured under a standard and controlled production process in our manufacturing unit. Further, these products are treasured for their sturdy construction and reliable performance. All Type of diving helmets if intersted kindly send us inquiry thank you. Brass & Copper Made Divers Helmet. One of the best and best known diving helmets in the world is the US Navy Mark V. Until about 1912 there was hardly any serious (deep) diving activity in the US Navy. Commercial Morse and Schrader helmets were used. 16-inch tall antique finish reproduction of the Mark V diving helmet.